This is one of the most advanced voice recorders for Android with the ability to record telephone conversations (however, in the paid version). It differs with stylish “material” design and a lot of settings. Parrot has a rich functionality and a huge number of options. The recorder is able to save files in cloud storages, it differs with a visual recording process with a graphical display of the level in the form of a sound wave. The program allows you to select a microphone, including Bluetooth devices, permits you to use various effects when recording, supports recording in the background, sound and vibro notifications. 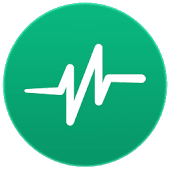 It is also possible to use auto-pause with adjustable threshold and control of the recorder using devices based on Android Wear. You see, there are various settings for different situations. Recording. Record audio tracks with a live audio signal. When recording, you can pause, start, and stop any track. Play. View a list of all entries made, one-touch playback. You can rename, send, copy, and modify your tracks. Share. With two touches, you can share any record via text message, Email, Bluetooth, and much more! Notifications. Parrot sends a notification when it starts and ends the recording. With this function, the application is convenient to use in the background. Control the recorder from your Android Wear device. In the Parrot recorder under Android, the basic functionality is available completely free of charge and without restrictions. Through the built-in purchases, you can purchase the ability to record telephone conversations, start recording on a schedule (date, time and duration), and back up all records to cloud storage (Google Drive, Dropbox) or to the specified folder on the device. As a powerful voice recorder, Parrot allows you to choose the audio file format (stereo or mono recording in WAV and MP4 formats), bitrate and even sample rate. Also, the application allows you to include suppression of background noise, subtraction of echoes and automatic control of recording level. The Parrot application is an excellent voice recorder for Android for professionals and advanced users, especially with paid features. Check also 16 Best microphone apps for Android.